This post is based on our recent article ‘Ranking for Success‘ by Ruth Dixon and Christopher Hood in the Oxford Magazine about uncertainties and unintended consequences of university rankings. 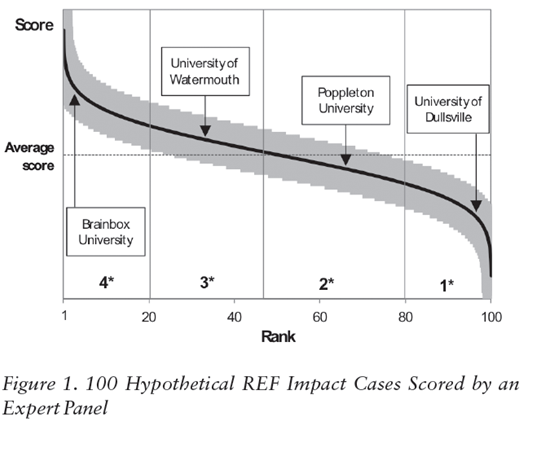 In the forthcoming Research Excellence Framework (REF) exercise, ‘impact’ accounts for 20 % of the score. Impact is assessed by expert panels. If we (conservatively) estimate the errors that might be associated with this assessment, differences in rank between one institution and another can be statistically insignificant as we illustrate in Figure 1. Figure 1 from Ranking for Success, Dixon and Hood 2012. In our new paper we show that cutting administration costs is difficult both for the government to do and for the public to evaluate.